Commodore Oliver Hazard Perry was born on August 23, 1785 in South Kingston, Rhode Island. He was a man of strong emotions and known for his energy and resolution. At the age of 13 he entered the United States Navy and served under his father in the Caribbean. He continued to gain experience while fighting for America during the Barbary Wars in North Africa at the turn of the nineteenth century. 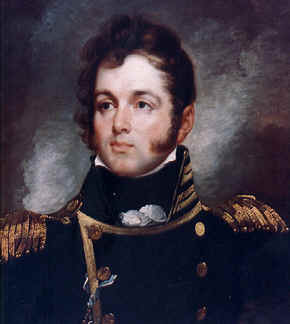 During the War of 1812, Perry was first given command of gunboats at Newport and New London, and spent several years supervising the construction of new American ships. Congress began to call for an extensive squadron to harass the enemy on their own coasts. Perry, longing to be a part of the action, offered his services for the command of one of the squadrons. He was chosen to serve in the Great Lakes and given orders to “destroy the commerce of the enemy”. 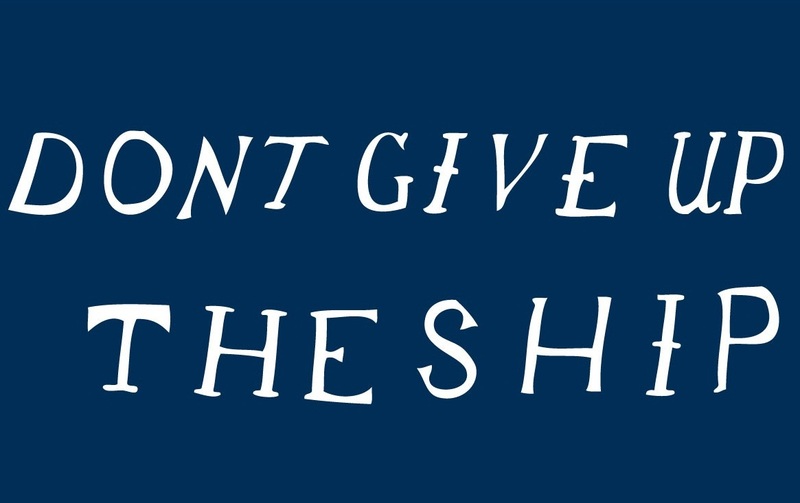 Moved by the destruction of the USS Chesapeake and its captain’s last words, “Don’t give up the ship”, Perry had a blue flag made on which the words were sewn. This flag would fly and serve as a rallying cry during the battle of Lake Erie. In Erie, Perry was given command of two large ships and a number of schooners. He enjoyed five weeks of command of the lake before the battle on September 10, 1813. Moved by food shortages, British Commander Robert Barclay left his defensive position and advanced on Perry. The smaller American vessels utilized their superior firepower, but the ship Perry fought on, the Lawrence, was shot to pieces. Perry survived and transferred to the Niagara, taking his blue flag to continue to inspire his men. While the British thought this signaled surrender, Perry swept round the British ships, annihilating the enemy from all sides. Perry wrote of the victory to his commanders, boasting “we have met the enemy and they are ours”. The British were in full retreat, soon to be overtaken by other American forces. This battle was decisive for many reasons. While American soil was clear of British invaders, they were able to gain control of Detroit and make American expansion into the Northwest a certainty. The United States proved its naval strength and a national spirit was developed, improving public mood during the war. Additionally, British aid to the Natives was cut off, ending dangerous Indian hostility in America. Following the burning of Washington, the British navy arrived off Alexandria on August 27, 1814 to attack Fort Washington. Secretary Jones ordered Perry to come to Washington with all his men as soon as possible. Perry had been stationed in Baltimore, supervising the construction of his new ship, the USS Java. He was sent to Indian Head in Maryland and his position was fortified by September 5. As the British squadron under James Gordon descended the river, Perry opened sharp fire, but had too few guns of too small caliber and lacked sufficient ammunition to hold up the enemy ships. The failure of the ammunition prevented Perry from deriving full advantage from a favorable position. After the War of 1812, Perry was promoted by President Madison to the rank of Captain and he continued his superintendence of three vessels. He served in Venezuela in 1819, but during his time there he contracted yellow fever. Unable to recover, Perry died at sea on August 23, 1819. In 1826 a monument was built to commemorate his brave service in Newport, Rhode Island. Click here to listen to and download a folk song from the period, “Perry’s Victory,” about the Battle of Lake Erie, recorded by Roger McGuinn of the Byrds. “Battle of Lake Erie.” Ohio History Central – An Online Encyclopedia of Ohio History – Ohio Historical Society. http://www.ohiohistorycentral.org (accessed April 16, 2012). “Commodore Oliver Hazard Perry.” Erie Maritime Museum. http://www.eriemaritimemuseum.org/ (accessed April 16, 2012). 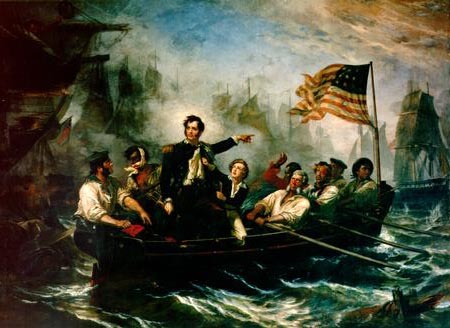 “Commodore Oliver Hazard Perry.” Surface Navy Association. http://www.navysna.org (accessed April 16, 2012). Dudley, William S. Maritime Maryland. Baltimore: Johns Hopkins University Press, 2010. Forester, C. S. The Age of Fighting Sail; The Story of the Naval War of 1812. Garden City, N.Y.: Doubleday, 1956. McGuinn, Roger. “Perry’s Victory,”. mp3 file. http://www.ibiblio.org/jimmy/folkden-wp/?p=7078. (accessed April 29, 2012). Whitehorne, Joseph W. A. The Battle for Baltimore, 1814. Baltimore, Md. : Nautical & Aviation Pub. Co. of America, 1997.